A small, rocky chunk of land in the English Channel has been named the world's first dark sky island, a distinction awarded because its low levels of light pollution allow stunning views of the night sky. The International Dark-Sky Association (IDA) recognized Sark Island, which is about 80 miles (129 kilometers) off the south coast of England, for the quality of its night sky. 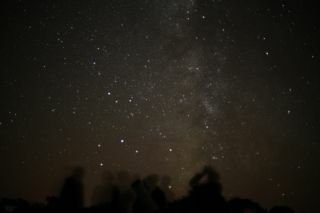 Sark thus becomes the latest in a select group of dark sky places around the world, and the first island. Sark, which is just 3 miles long by 1.5 miles wide (4.8 by 2.4 km), has no public street lighting, no paved roads and no cars, officials said. As a result, its night sky is very dark, with the Milky Way stretching from horizon to horizon, meteors streaking overhead and countless stars on display. "This is a great achievement for Sark," Roger Davies, president of the Royal Astronomical Society in the United Kingdom, said in a statement. "People around the world are becoming increasingly fascinated by astronomy as we discover more about our universe, and the creation of the world’s first dark sky island in the British Isles can only help to increase that appetite." The award follows a long process of community consultation, which included an assessment of the sky darkness and an audit of all the external lights on Sark. A comprehensive lighting management plan was created, and many local residents and businesses altered their lighting to make them more dark-sky friendly, officials said. The Milky Way above the Seigneur's Mill on Sark. "Sark becoming the world’s first dark sky island is a tremendous feather in our environmental cap, which can only enhance our appeal," said Paul Williams, chair of Sark's Agriculture Committee, which oversees environmental matters. "Sark is a wonderful island and this recognition will bring our uniqueness and beauty to a wider audience." The designation means that Sark joins a select group of sites around the world chosen for their dark skies, including Flagstaff, Ariz., and Utah's Natural Bridges National Monument. "This is an ideal opportunity to bring stargazers to the island throughout the year, and I think that Sark is about to see a boom in astro-tourism, especially in the winter months," said Steve Owens, the dark-sky development officer who headed Sark’s application to the IDA.